The death penalty in peacetime was abolished in 2001 (while hanging Abdullah Ocalan, who had just been brought to Turkey, was discussed) and the death penalty in wartime was abolished in 2004 in a relative consensus. More than 35,000 people were arrested in Turkey and a total of 82,000 have been investigated since the attempted coup on the 15th of July. Out of those who were investigated, 26,000 had all charges dropped. Three anarchists were arrested in Warsaw recently, accused of an arson attempt on a police vehicle, put in isolation and tortured. Now they are free but they still face trial, amid a media frenzy against them, and anarchists in general. 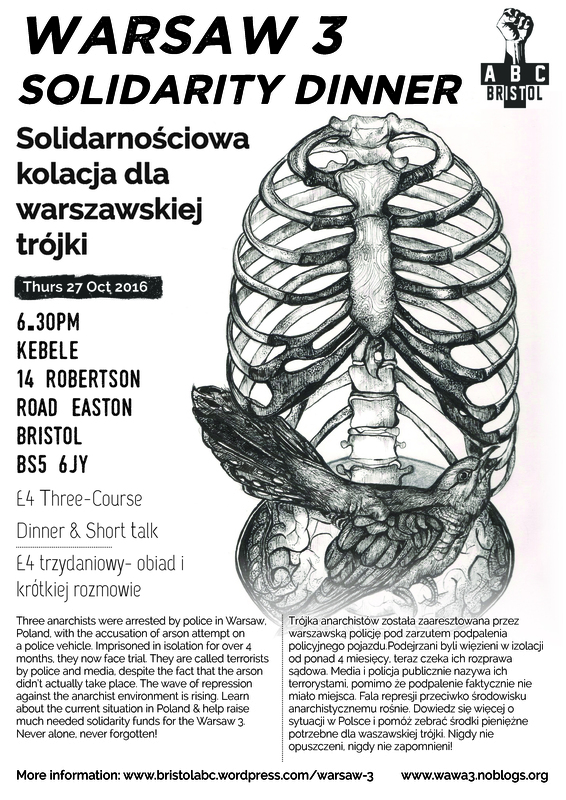 Come and support them by helping to raise money for their legal costs and learn about the wave of repression in Poland. Never alone, never forgotten!